let the lower lights be burning. – i was bound for mexico. we had slipped in to a nice routine at our swanky waterfront beach resort. this was our second time tagging along on christian’s california work trip. staying in pretty much the same spot – the weather was warmer than last time and asher was a few months older – all making our stay idyllic. while christian sat through all day conferences asher and i ate breakfast on our balcony, visited the koi pond, and splashed at the pool. we’d walk over the bridge down to the beach where he squealed and crawled toward the sea-foam. we shared egg and avocado sandwiches downtown. we would walk to the little neighborhood wal-mart for supplies and we ran along the boardwalk. in between adventures we would say hi to christian on his breaks in the hotel lobby. his coworkers soon recognized us and would stop to say hi. before we even arrived in huntington beach, i had my heart set on one thing. and one thing only. the food truck round-up at the fairgrounds. i read about all the trucks and had a plan of attack for what we should eat. sadly, this is not a story of food truck dreams realized but rather one of poorly made decisions and more importantly, not listening to my own misgivings. scoping out things on my phone i discovered a trader joe’s not too far away. i figured we could run there, get some food, and enjoy more of the pacific coast boardwalk. i surely must have factored in the distance (nearly seven miles). i also must have taken in to consideration the fact that my recovery from childbirth had prevented me from running until just recently. but knowing how this adventure ends, i am positive i did neither of those two things. and so, we set out, wholly unprepared. it was warm as we ran south toward newport, the landscape changed and the sun heated up. i watched for the major cross streets, thinking brookhurst wasn’t too far off. when we arrived at that traffic light, i acknowledged we still had a way to go, even though i somehow didn’t quite comprehend how far. i continually criss- crossed that thoroughfare in an attempt to chase the shade. somewhere along that road, parked under a palm tree against a cinder block fence, i checked on asher. i gave him some water, and i began to realize my folly. peering down at my phone i tried to make out where we were on the route despite the glare from the sun on my screen. we were many blocks away – but the distance back to the hotel seemed equally daunting. despite the distinct thought to turn around i pushed on in that blistering sun. pursuing the siren call of trader joe’s. the city blocks we now entered were very different from the calming beach. it was loud and busy. for some reason this change scared me. with each slowing step of my pace i knew i had a made a mistake. i frequently stopped to splash some water on asher. the mecca of trader joe’s seemed more like a mirage, offering only temporary relief with its air conditioning. i was not eager for the rest of the journey but i knew there was no other way. i was horrified to realize our return trip would place asher in the direct sun light. i didn’t have a blanket. i didn’t have sunblock. i cried on the side of a residential street, angry my bad decisions would now have an adverse affect on him. i whispered a weak prayer. i asked for help. i pleaded he’d be safe. even though i didn’t think i could run another step, i wanted to get him to safety quicker so i pushed myself to run. i navigated the streets doing my best to make sure we would only have to run directly in to the sun for a short amount of time. in the middle of that last sunny stretch along atlanta avenue, when my heart was breaking due to my stupidity, i saw a beautiful green lawn up on the left. i knew, immediately, it was one of my chapels. that beautiful chapel was a symbol of safety. i cried again, but this time out of gratitude. we found shelter from the sun on the porch. 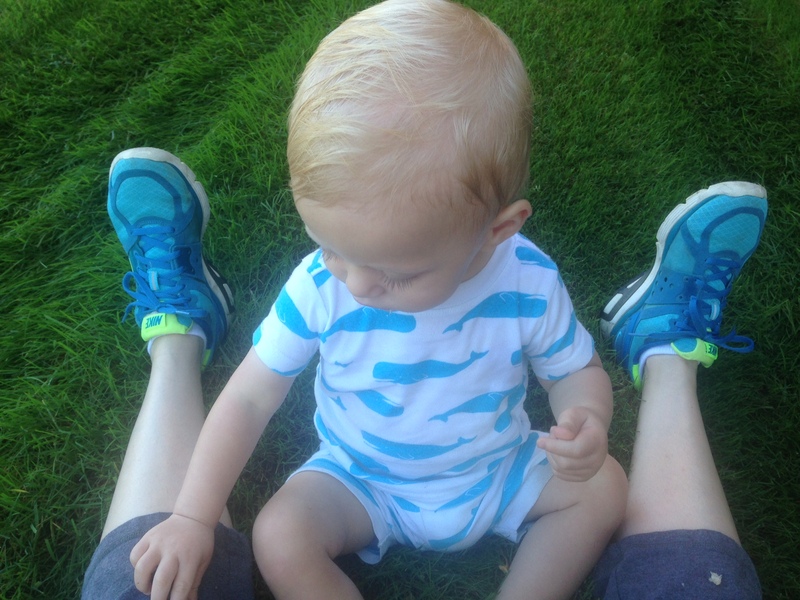 i took a sweaty little whopper out of the stroller and let him crawl on the grass. a cool breeze embraced us and in that moment, i knew a loving heavenly father had protected us despite my stubbornness. back at the hotel i paid dearly for the deafness of my ears that day. a migraine leveled me and there would be no food truck round up for us that night. Is it weird that that is our church now? If you are coming back this way I’d love to meet up! That is awesome. I thought that chapel was so pretty!